Last night Nonna made polenta, which she served up with a rich tomato ragu’ of Italian sausage and the remains of yesterday’s barbecued beef ribs. Today we’ll have the rest of the polenta, cut into pieces the size of Tim Tams, baked in the oven then fried and covered with melted gorgonzola. The only drawback with polenta is that it clings to the surface of the saucepan like yellow cement and makes washing up a nightmare. In the Veneto region of Italy polenta used to be a staple before women found the enlightenment to break a culinary tradition that had lasted since the Venetians first introduced maize from the New World in the 17th Century. Now they serve up dishes that relieve them from stirring and scouring pots for half an hour each night. Fittingly, it was in the Veneto that I first tasted this dish of ground cornmeal prepared in the form of porridge. As a relief from apartment life in the centre of Verona I had bought one of ten or so terraced 18th Century case di contadini grouped around an uneven piazza in the Comune of Mezzane di Sotto, a small village located some 30 kilometres north west of Verona. 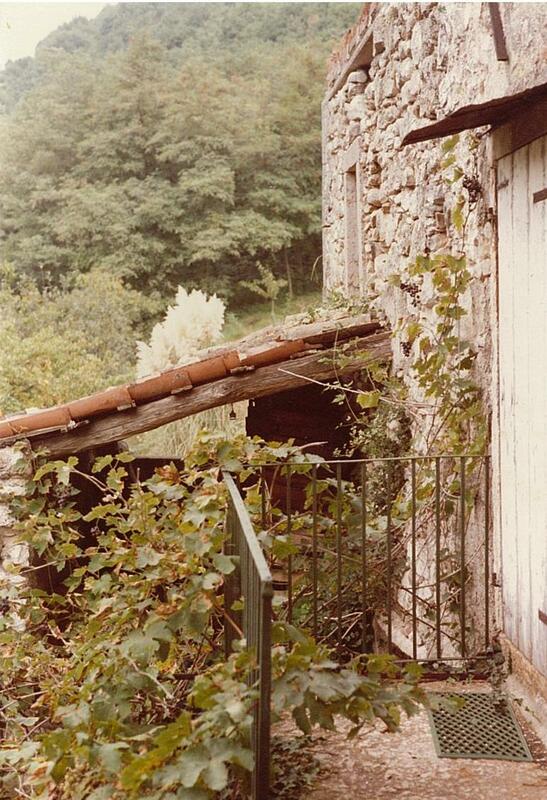 There was a small plot of land behind the house, a field with a kaki (persimmon) tree, some long-neglected vines, a tangle of silver birch and willow along the bank of a narrow torrente. 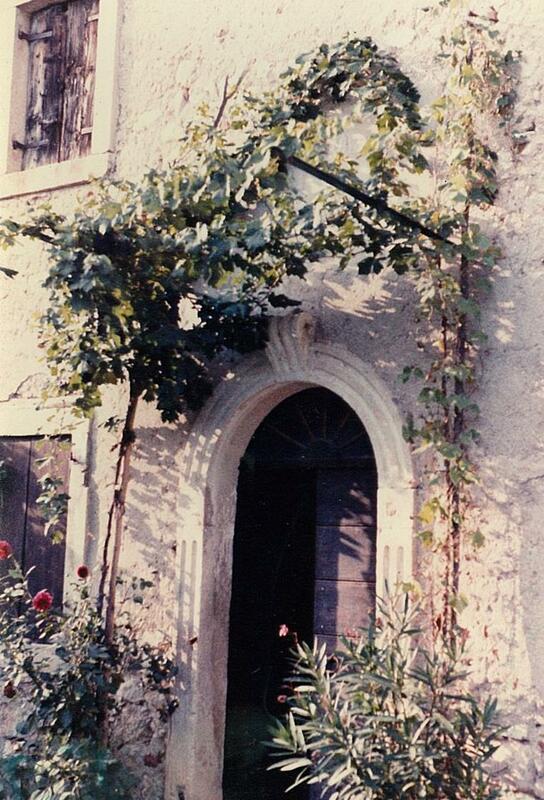 On weekends we would drive out to the house for a day of gardening and daydreaming of what we would do with the house when we had the funds necessary for its restoration. 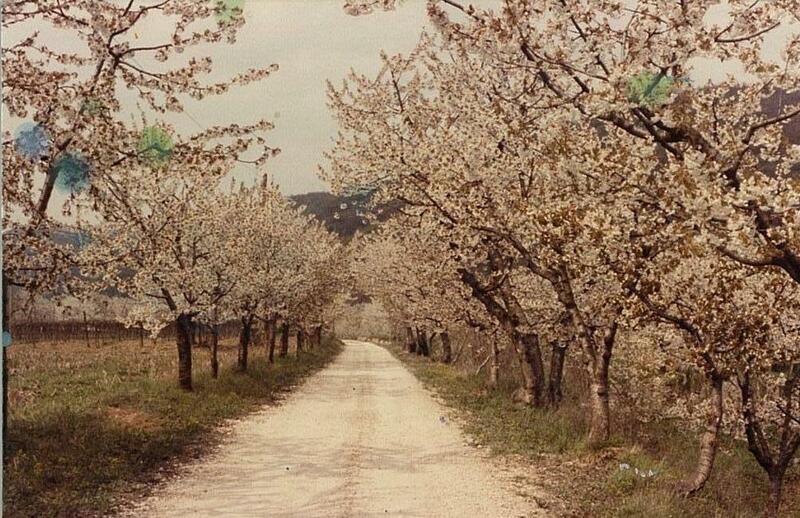 Our weekly journey took us past the village of Mezzane di Sotto, off the metal road that continued on up to Mezzane di Sopra and onto a “strada bianca” or unmade road that wound through orchards of cherry, Houseman’s “loveliest of trees” [i]. In springtime light winds dusted the track with their bloom and we drove through a tunnel of snow. 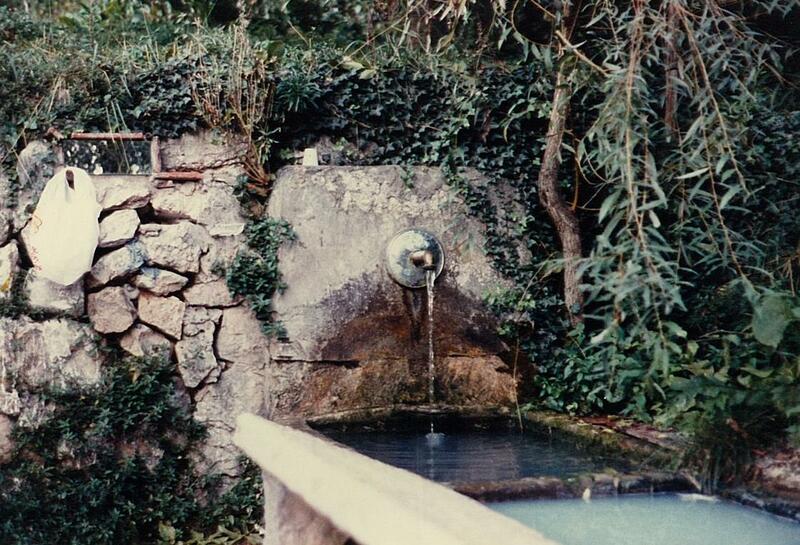 The strada bianca that brought us to the hamlet rose sharply into the foothills of the Dolomites passing a medieval stone trough, supplied by a constant trickle of cool spring water and once used for washing the community’s bedding and clothing. Bordering the hamlet was a torrente, gushing with water from the melted snows at the outset of spring and, in summer, a hot dried bed of white stones overhung with willow and buddleia, teeming with butterflies. In this earthly paradise Antonio, the hamlet’s only permanent resident, hunted all year round with calm disregard for the imposed limits to the seasons and lists of endangered species. Nothing he killed went to waste. The flight and contour feathers of birds were made into dusters, the down into stuffing for cushions and pillows. No part of an entire pig went to waste, and from the ceiling of Antonio’s cellar hung every conceivable type and size of salami while in his shed there were cages of rabbits, wild birds and snails waiting to be served up in a sugo for the nightly polenta. The only animal safe from Antonio’s gun was Stellina, his small, black and white, hyper-active dog that would race down the track to meet and yap at any approaching vehicle. Antonio, then retired, lived with his wife Adriana and teenage son Andrea, who worked at the local supermarket. Although they lived permanently in the hamlet, the family had no car, no hot water (unless boiled on the wood-fired stove), telephone or indoor toilet. We first met Antonio and his family shortly after we had bought the house. It was while Cristina and I were clearing the garden one warm, Sunday morning that Antonio and Adriana (then in their fifties) appeared from nowhere, scythe and sickle in hand and, without a word, began working alongside us. Later, over bread and cheese and wine, which they had also brought, we were invited to dinner. That evening over a meal of polenta con lumache (snails) we negotiated the exchange of my kaki tree for a cherry tree and began a friendship that would be terminated only by my incessant desire for change. We soon understood that the family ate polenta every evening, Adriana standing, stooped into the fireplace, patiently stirring a cauldron for what seemed hours before pouring the molten porridge onto a wooden board in the shape of a huge ping-pong bat where it was allowed to cool and solidify for a couple of minutes before being cut into serving portions with a length of string. The most popular of the family’s polenta dishes was “con osei” (with sparrows). Cristina was put off by the tiny, brittle feet and beaked skulls that protruded from the polenta, for the birds, plucked and fried, were tossed in and eaten whole. The rest of us crunched away happily. Antonio had his own, unique way of catching the sparrows. Scattering some seed under the kaki tree that sat in the middle of the small yard behind the house, he would stand at the window of the outside toilet and wait until there were a number of birds pecking at the seed when he would release the end of a rope (looped cunningly over the tree’s branches), letting a lampshade fall over the unsuspecting sparrows. After dinner Adriana would scour the polenta pot and then watch the black and white grainy images on their antique television while I would help Antonio manufacture cartridges for the next day’s hunt. One winter evening on a solo visit, I was persuaded to stay overnight. Adriana showed me to my room and pulled back the bedclothes to remove the bed-warmer – a wooden “cage” in which sat a saucepan full of red-hot coals. Pleasantly drowsy after a meal of polenta con coniglio and a bottle of Antonio’s unlabelled Valpolicella, I slipped between the rough, toast-warm sheets, blew out the candle and lay for a while contemplating the cold, starry sky, overcome with a feeling of peace and security. I had been, as I recognized later, experiencing true happiness. In October of 1986, Antonio and Adriana were at our wedding lunch in Mezzane di Sotto at the Bacco D’Oro. There was Risoules ai carciofi, Tortellini al burro fuso e salvia, Rusteghi alla Selvaggina and Anitra al forno, but no polenta. Last night I tried to locate our little hamlet at the end of the cherry road using Google’s satellite map but with no success. Perhaps, like Brigadoon, it only appears, briefly, once every hundred years. In the spring of 1961 many of my fellow foreign students at Grenoble University received letters and phone calls from their worried parents, concerned that their sons and daughters would be caught up in an invasion of France by units of the Foreign Legion and the OAS, (Organisation de l’Armee Secrete) in their attempt to topple the government of Charles de Gaulle and prevent the independence of Algeria. To the French, Algeria was more than just a colony, it was as much a part of the country as Burgundy or Aquitaine and the cry of “Algerie Francaise!” was not only heard from France’s citizens who lived in her favourite colony. In the event, the Generals’ coup failed and the process of independence continued. But the ferocity of the 8 year long war and the massacres perpetrated on both indigenous and French civilians, meant that there would be no home in Algeria for the settlers after independence. Alarmed by the cry of “La valise ou cercueil” (suitcase or coffin), the settlers began seeking safety in France even before independence was finally declared in July of 1962. They were not returning home; many had never stepped foot in France before. Coming from Spain, Malta and other European countries besides France, they had been colonizing Algeria since the country’s annexation in 1834. They were the (relatively) wealthy middle class and called Pieds-Noirs or Blackfeet as the only wearers of boots among a largely sandaled or barefoot people. In 1962 there were approximately one million Pieds-Noirs in Algeria – over 10% of the total population – including 150,000 Sephardic Jews, who had arrived well before the largely Catholic colonists, originally in Roman times and more recently during the Spanish Inquisition. The 900,000 Pieds-Noirs who arrived in France during 1962, considered responsible for the war and loss of colony, encountered resentment and even violence. Many had destroyed their possessions rather than leave them in the hands of the Algerians; all had to adapt to a foreign culture, a strange climate. Many had to learn new ways to earn their livelihood. Madame Pierre Very opened a restaurant near the Place de L’Alma at 44 Rue Jean Goujon and it was there when I returned to France in the early 70s that I first tasted the cuisine of Algeria. There were many North African restaurants in Paris, from grubby bistros catering to the poor Algerian immigrants clustered around Pigalle’s rue du Gout d’Or to the flashy charm of Charley de Bab el Oued with his “ambiance de Mille et Une Nuits” and his couscous royale, complete with the euphemistically named rognons blancs (rams’ testicles) on the boulevard de Montparnasse. In contrast the discreet, bourgeois décor of Madame Very’s restaurant, le Martin Alma, gave no indication of the provenance of the dishes on offer – Brik a l’Oeuf, Calamars a l’Oranaise, le Turban du Pacha and Madame’s signature dish, le Mechoui de Ghardaia. As the restaurant was a two minute walk from Ernst & Young’s office in the avenue Montaigne, my colleagues and I enjoyed many a mechoui at le Martin Alma, usually preceded by a brik and washed down with the powerful and fruity wines of Sidi Brahim and Mascara, a legacy of Spanish immigrants who had introduced the Carignan grape. By chance, an opportunity to taste a real mechoui was provided by an Ernst &Young client who requested an audit of a pulp and paper mill they were constructing on the Algerian coast near Oran. Joining up at Orly with Michael Morris (1), on loan from the London office, we set out for the coastal town of Mostaganem (2) on what was to be the first of many trips. The exodus of the Pieds-Noirs had left Algeria without a professional class. Cars, including taxis, ran on near-bald tyres. Chronic overbooking by Air Algerie, coupled with a system that required departing passengers to register their baggage before their person, often resulted in luggage arriving at the destination days before its owner. No shop or restaurant accepted credit cards. The plant was also in trouble. The government, in the expectation that the project would be completed on time, had cancelled all cellulose imports, including toilet paper, from the scheduled date of start-up so that suppliers’ invoices and delivery notes, central to the audit, were no longer in the archival system but pinned to lavatory walls. To reduce costs the government had substituted the normal wastewater re-cycling and incineration systems with a simple pipe which discharged a lethal cocktail of dangerous chemicals directly into the sea, covering the bay as far as the eye could see under a blanket of sludge, depriving the local fisherman of their livelihood and the local restaurants of their fish and crustacean dishes. In spite of the shortages and shortcomings the Algerian people were still in euphoric mode; they had, after all, defeated a major Western power which, at one point had as many as 400,000 troops concentrated against the insurgents of the FLN (Front de L’Armee Nationale). Michael and I were treated with the cordial bonhomie of the victorious and none more so than by Arif, the plant’s Chief Accountant. Mostaganem was not a particularly beautiful town and the hotel had minus stars. But the people had the uncomplicated honesty and charm that the Parisians had lost in the middle ages and there was something in the air, something in the early light when the Muezzin began calling “Come to Prayer, Come to success, Allah is Greatest” from the minarets that made one eager for the day. I could understand why the Pieds-Noirs were so reluctant to leave. Like most Arab countries the cuisine of Algeria is sheep-shaped and there was little else on offer in Mostaganem’s few restaurants. Strangely, although we dined on spicy lamb sausages (merguez), Shawarma, thinly sliced lamb wrapped in a warm khabz (arab flatbread) and lamb couscous, the mechoui I was looking forward to was conspicuously missing from the menus. But Arif was to change all that when he proposed a trip to see the Roman ruins at Timgad over the coming long weekend. We started off very early in the morning, heading East before the sun was up, well before the faithful were called to prayer, following the Barbary Coast alongside fields of esparto grass, bypassing Alger le Blanc before cutting inland towards Batna. On a plateau, some 40 kilometres from Batna lay Timgad, cunningly devised by the Emperor Trajan in the first century AD to serve both as a retirement home for Parthian (3) veterans of the 111th Augustan Legion of the Roman army and as a bulwark against marauding Berbers. The orderly rows of humble soldiers’ houses, as much as the impressive triumphal arch of Trajan, sent a chilling reminder of the frailty of civilisation. It was also as good an inspiration as any for Shelley’s Ozymandias (4) for Timgad, once in the midst of green fields, was now surrounded by the “lone and level sands” of the Sahara. On our return, fifty or so kilometres from home, Arif pulled the car off the road and stopped where a few odd-shaped sheep, supervised by a ragbag shepherd, tugged at scattered clumps of coarse grass sprouting amongst the stones. We watched Arif point to a particular sheep, saw it hog-tied and tossed, live and bleating, into the trunk of the car like some unfortunate hostage. “Fat-tailed sheep (5)” said Arif as we drove off, “very good”. Later, as he dropped us at the hotel, he invited us to dinner the next evening. Arif’s home was a single-storey building of faded pastel stucco, tiled floors and minimal furnishings. The room we were shown into was empty except for 5 or 6 other male guests and a table. The sheep we had seen snatched from the roadside yesterday had been roasted on a spit in the open over the embers of a wood fire, basted with butter, spices and its own fat, and now lay before us in its entirety on the bare table. It was, as it was meant to be, as authentic a reenactment of Abraham’s sacrifice (6) as you could wish. There was no cutlery. Wine was served from a Jerry-can still bearing the markings of the Willys Jeep from which it came. Shortly after the introductions a guest dipped his fingers into the sheep’s body, expertly peeled off a sliver of meat, and popped it into his mouth. Within seconds everyone followed suit. If the concept of “terroir” applies to wine, how much more should it be associated with food? This was nothing like the mechoui on Parisian menus. How could it be when Madame Very’s lamb came from the salt marshes of France and was grilled in joints on the restaurant rotissomat? These special tastes and occasions remain with us forever as unconscious benchmarks, never to be relived. Every subsequent mechoui, in some measure, would fail to please. Some days later I left Algeria. At the airport women gargled their shrill alalalaalal farewells to their departing men-folk. In the departure lounge girls entered the bathroom veiled and came out dressed in modern, western clothes. In the air I completed the landing card of the Algerian man sitting next to me, leaving blank his date of birth about which he was unsure. Word of my literacy, ownership of a pen and general willingness to help quickly spread through the cabin and before we landed I had completed the cards of half the passengers. Many were young or middle-aged men going to Paris where they would work as refuse collectors, cleaners and Metro workers, living in squalid apartments in Barbes Rochouart, sending the bulk of their thin wages back to their families. In time their sons would become French citizens, live permanently in France and take over the corner epicerie, keeping it open 24 hours a day. In turn the shop owners’ sons would become doctors, business managers and accountants, a new generation of Pieds-Noirs. 1. Michael Morris – aka “Mercury”. Later Lord Morris. 2. Port approximately 80km East of Oran. Founded in the 11th Century, captured in 1516 by Khayrad ad-Din (better known as Barbarossa); under Ottoman rule from the early 18th Century until colonized by the French in 1833. The town now has its own tourism website. 5. Strain of domestic sheep common in North Africa and the Middle East and prized for the fat stored in their prominently large tail and backside. Depicted on pottery and mosaics of the 3rd millennium BC and described in Chapter 3, verses 8, 9 and 10 of Leviticus. 6. Abraham’s sacrifice is celebrated on the 10th day of the last month of the Muslim year during the festival of Eid-el-Kurban, when mechoui is traditionally served. Mechoui is also prepared for festive occasions such as weddings and receiving (special?) dinner guests.